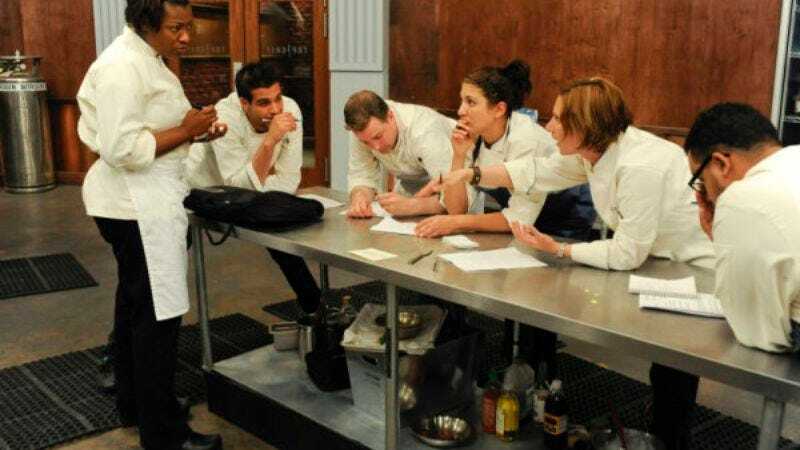 This week’s episode kicked off with the stunning announcement that only six chefs remain in the fight. Wait, I thought—only six chefs left and things are still this snoozy? This season sure has presented us with a pack of bickering chefs with lukewarm personalities and cooking skills to match. Perhaps that’s unfair; they clearly can cook, but no one seems to be truly creative or inventive. There aren’t really any restaurants I’m dying to try based on the turnout this season. Come to think of it, I’m not sure I have a true sense of many of the chefs’ styles based on the offerings so far. Are the judges pulling punches, or merely content? In any case, we’re not getting a lot of “wow” from them this season, and we’re hardly getting anything from new judge Eric Ripert. I’m always startled to see him appear on the screen. Oh yeah, he’s on this show! Rick Moonen appeared as the guest judge this week, and the logical challenge, as Tiffany guessed early on, would have been to make use of his talents and have the chefs cooking fish for His Royal Fishiness. Let an expert provide a real, tough critique on our chefs’ fish skills. But no; instead the chefs were asked to riff off of food-themed idioms to create dishes…that could be frozen to fit a sponsorship. Hooray for mixed metaphors! So off they went, snagging up sour grapes and hot potatoes, no one really taking interest in the sense of the phrase or play on words but just straightforwardly using the ingredient in question to make a quick, random dish. Ed takes home the win with a well-conceived gnocchi that he managed to pull together in a hurry; bratty Angelo says he looks like a hot potato and would be well-suited for a frozen-food box. The constant cutaways to Amanda being overly obnoxious as she interpreted the episode’s unfolding were an early clue she might be the one heading home. The bitter, self-conscious jokes made her uglier and uglier to the point where I really felt I was supposed to hate her. Good job, producers, and good riddance, Amanda! She packed her knives because of a gray, oxidized tuna tartar, which the editors would like us to believe might be Angelo’s fault. Sorry, Top Chef, I’m not really buying the drama here. Yes, she asked Angelo about using a grinder, but her real mistake was making the tuna the day before so that it lost its fresh-looking color. She was among three other chefs on the bottom: Kevin for soggy fries and chicken on a too-long skewer, Angelo for a soppy-breaded pork sandwich, and Kelly for a too-salty crab cake. As I said up top, not too many of tonight’s offerings really felt like a quality effort; even among the consistent winners, Tiffany and Ed, we’re not much innovation. Ballpark (or barbeque, or picnic, or any other random Americana finger-food) challenges should be more fun; these challenges just have the chefs cooking whatever they want with very few constraints, disabling us from really seeing the talent. Heading into next week, who’s going home? My money’s on Kevin. - You’ve got to give it to Moonen for at least trying to inject some personality with the “baseballs” remark. - Scott Tobias will return next week. - Hide the salami? Really, Top Chef? - All that he-said she-said at judge's table does nothing for these chefs' professionalism. Annoying to watch.